Gain insights that are important to your business. Our unique monthly Domain/Web Report provides you with information that can help you grow your business in an effective way. Filterpedia website analytics not only lets you measure visits and conversions, but also gives you fresh insights into how visitors use your site, and how you can keep them coming back. 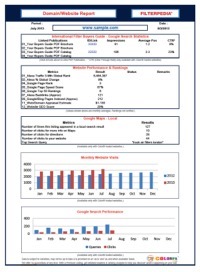 Our unique monthly reporting helps you analyze visitor traffic and help paint a more complete picture of your audience. The report tracks website performance and rankings, Google page rank, SEO score, pages indexed, Google search performance including number of search queries and clicks (CTR). If you have an eCommerce site, you’ll be able to find insights into which of your campaigns brings more visits, sales and other actions from your on-line users. In addition, the report tracks your Google Maps information including number of times your listing appeared, number of clicks for more info on the map and more. We breakdown visitor statistics by continent, country and city so you can understand the origins of your traffic and find the best places to invest for future opportunities. Click here to view a sample page from our Domain/Web Report. Know your SEO score – Evaluate and improve SEO efforts. Contact us today to see how we can help you manage and improve your website reporting.